This is a powerful picture of a microscopic battle which rages in all of us from time to time, that of our own killer cell soldiers attacking an individual malignant cell in order to keep us healthy. The clover-shaped cell at the upper left of the photo is a dividing malignant cell. The elongated cell in the middle of the photo is a killer cell, a powerful soldier in the army of the body’s immune system. This picture depicts the attack on the malignant cell by the soldier, seen as a straight line from the soldier to the mutant. This is the response that must be mounted by our immune system’s killer cells if we are to stay healthy. The soldier here is doing his job. The caption reads: Photo 1. Metastasizing cell unit of a lung carcinoma, isolated from the bloodstream while alive, surrounded by macrophages. This is what the immune system is supposed to do, recognize, attack and kill mutants and invaders. There is much known today about how smart cancer stem cells are, how they can hide by lodging in the body (as I have cancer stem cells lodged in my bones right now), and how they can even hide in plain sight, going unrecognized by our killer cells in tumors and in the bloodstream. I am here in Munich because my immune system is currently losing this war on cancer within my body. That is a fact. But why? Are the mutants going undetected? Do I not have enough active killer cells? Or are my killer cells not strong enough to win the war? 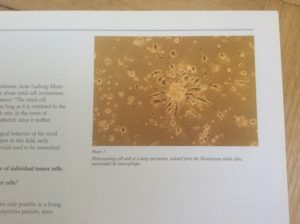 Are my own killer cells being mutated and converted? We know that cancers grow for many years, perhaps ten years, before becoming detectible even on a mammogram, for those tumors which can be seen on a mammogram. 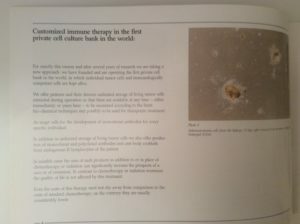 That’s a long time for the immune system to get it right. My cancer had been winning for long enough that I was forced to look at defeat. In the spring of 2016, if my lifestyle were not so active I might not have known that I felt terrible. Many cancer patients say they never did feel terrible. But I was teaching and practicing and running with my dogs every day, and I was tired. I taught a two-day seminar the first weekend in May, completely normal, and I thought I did a fine job of it. But I had to have Karen drive me home, and she could not stop telling me that I looked awful and something was wrong. Your friends might not tell you, but your best friend SHOULD tell you. If my body had been able to overcome my cancer at the microscopic level I would not have the tumors and the metastasis that I do have. My cancer had been winning for a long time. During the process of finding out what was wrong and then how bad it is, I had to make some big choices. Long arduous story short, this is the decision I made. A person whom I have not yet met but will meet soon, a client of Karen’s, offered to talk to me at any time if I were interested in this sort of immunotherapy. I called her immediately after I learned that my cancer was Stage IV. Learning that my cancer was Stage IV took another six weeks after initial diagnosis. Many tests, scans, and biopsies added up over two months from the original worrisome ultrasound on May 20. My oncologist was chosen for me by my breast surgeon early on in this staging process, with the heartfelt recommendation that if I did not feel comfortable then I must say so and a different match would be tried. Every doctor with whom I met during my diagnosis was steady and kind. My first meeting with this oncologist, whom I liked immediately, was on July 1, when we knew that biopsies of the tumors and the lymph nodes were both positive. He agreed with the surgeon that the course of treatment should be chemo first followed by surgery, then radiation and potentially more chemo. So I called Karen’s client about this clinic. This is where she came some 15 years ago with incurable Stage IV colon cancer. My mom died of colon cancer. We hit it off and had many discussions about every aspect of treatment here, including the great expense. I didn’t know how I was going to swing it, but certainly there is no point having a retirement fund if one is not going to be around to retire. So I cashed out everything I could. I love my work. If I have to keep on doing it then I am lucky as well as blessed by that. Not one of the doctors on my team at home is in favor of the path I have chosen. They are professional about my choice, but they are only cautionary. They do not pretend to be supportive or optimistic. That has been difficult because I do respect each one of them. I just want something better and I am willing to sacrifice for it. http://www.aacr.org (search Steven Rosenberg for a concise summary of his contributions and accolades). This man is the mentor of Dr Kuebler. Dr. Kuebler’s Labor-Praxis Klinik is located in a beautiful section of Munich called Bogenhausen. It is near the Isar River and parks. The clinic itself occupies several floors including Dr. Kuebler’s office, the apheresis blood draw area with beds and a floor for their laboratory plus a floor for the office and examining room of the naturopath. Your first visit you usually meet briefly with Dr. Kübler in his office on the first floor and then proceed upstairs to the blood draw area with the apheresis machines. Dr. Kübler usually inserts the needle for the apheresis draw. His wife Mrs. Kübler runs the blood clinic and monitors the machines plus the scheduling of the blood collections. Your first visit as a cancer patient, you will be having a diagnostic apheresis test to determine the quantity and quality of your circulating tumors cells. In effect, this is a liquid biopsy with nineteen different types of tumor stem cell markers. Many of these markers have been discovered by Dr. Kübler in his medical research. It is a good idea to request a collection also for natural killer cells and for vaccine, in case these are needed. It is less expensive to do it this way during the diagnostic collection. The cell collection usually takes two to three hours. They request that you eat breakfast beforehand. Bringing a snack is helpful during the collection. Drinking plenty of water the day before is also important to help the veins be ready for the long collection. There is an extra chair next to each bed for a friend or family member to sit with the patient. Breast cancer patients may also be seen by Professor Staehler, an endocrinologist and breast specialist who does a colored ultra sound test on an elastography machine. This can show through color and value scales suspicious tumor areas. Professor Staehler also performs cryo surgery on small tumors. This is non- invasive with a probe inserted to freeze the tumor and degrade it without spreading more cancer cells into the blood stream. 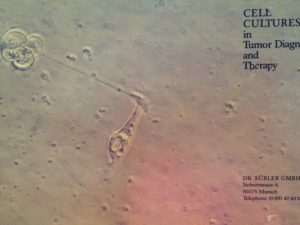 As an immunologist Dr. Kübler prescribes natural killer cell treatments to cancer patients to wake up the immune system to do its job to attack cancer cells. Natural killer cells are the Delta force of the immune system, attacking invaders and degrading them. He also recommends heat shock protein vaccine made from your own cancer cells. This puts a biochemical maker on the cancer cells in your system which alerts the killer cells to attack them. The natural killer cells are collected and then cultured and multiplied for three weeks and then given back to the patient with an IV. Here is what I have signed on for in Munich! The article is entitled: “Customized immune therapy in the first private cell culture bank in the world.” This is where my treatment is being personalized to my body. My killer cells will be able to recognize malignant cells because tumor stem cells from my own body will be altered to make them recognizable by my killer cells. This is done in the laboratory, where it can be seen and not just guessed about. Then my “smart” killer cells will be proliferated, and reinfused into my body three weeks later. They will then recognize my cancer stem cells and they will attack them in greater numbers and with the effectiveness you saw in the photo above. That is my chosen therapy. I’m betting on me. I have now undergone that original apheresis test and had a meeting to go over results with Dr. Kuebler. Included in your results will be various numbers of circulating tumor stem cells. They usually are within a certain range. He likes to see tumor stem cells below 1000. When the tumor stem cells are below 1000 this greatly reduces the risk of major metastatic activity. My circulating tumor stem cells number in the range of 6,500. Not good. Therefore my prescribed treatment includes 18 rounds of blood collections and reinfusions. First thought on receiving the treatment plan: No, that is unacceptable. I must get home in time to run in the Springfield Cluster agility trials on Thanksgiving weekend. It took me a week to let go of that attachment. No, I will not be home for Thanksgiving, and I will not run at Springfield. Not this year. But hopefully for many years to come. I have a team of doctors and cell biologists here working on my personalized cure. I will meet on Oct 10 and 11 with the endocrinologist and breast specialist Dr Staehler who is also mentioned in the letter above. The two doctors will determine together whether and when I should be scheduled for surgery and how they will go about it without further spreading my cancer. Some of the patients here are sent elsewhere for specialized surgery. Others can be treated here in this klinik. So next week will be a big week. There are still many turns in the road ahead, but I have chosen my team and my path. And that is why I am here. I wanted more traditional treatment at home, but my oncologist reflects the standard of care when he says that my cancer is “sad” and cannot be cured. My prescribed treatment at home is the hormone blocker Femara and a new drug not yet FDA approved, called IBrance, a very expensive chemotherapy drug covered by insurance. But with full expectation that it would work for a time and then stop working, at which time it is expected that a new drug would be available to take its place. Chemo ongoing for the rest of my life is my sentence at home. I chose to come here and try something potentially more powerful: ME.